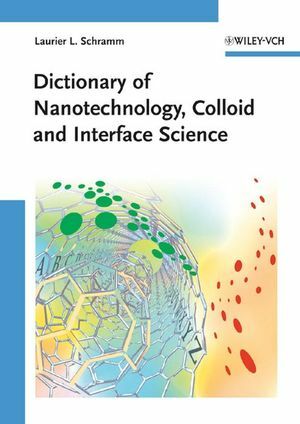 This manageably sized dictionary covers theory, experiment, industrial practice and applications for nanotechnology, colloid, and interface science, as well as much of what is now termed materials science. The comprehensive information is presented in several sections and formats: dictionary of terms, classification tables on colloid and nanomaterial types, and sub-term glossaries for specific phenomena, properties and methods. It offers both newly-coined as well as older terms whose meanings have changed, providing acronyms, synonyms, famous names, selected abbreviations, and cross-references. It also contains a historical overview, units and symbols, and a separate literature section for further reading and following-up on specific topics. Dr. Laurier L. Schramm is President and CEO of the Saskatchewan Research Council (SRC) and adjunct professor of Chemical and Petroleum Engineering at the University of Calgary. Prior to joining SRC, Dr. Schramm held a variety of professional and managerial positions with the Alberta Research Council, Petroleum Recovery Institute, and Syncrude Canada Ltd. His main research interests are in the applications of colloid, interface, and petroleum science. He has received major national awards for his research, and is best known for his basic and applied research involving petroleum industry applications of suspensions, emulsions, foams, and surfactants. He holds 17 patents, has published eight books, over 300 other scientific publications and proprietary reports, and has given over 100 national and international scientific presentations. Many of his inventions have been adopted into commercial practice. It is the significantly expanded and broadened successor to the author's "Dictionary of Colloid and Interface Science" (Wiley, 2001, ISBN-10: 0-471-39406-8), containing over 300 new terms in colloid and interface science and over 100 "nano" terms, over 150 revised or updated definitions, additional tables, additional biographical sketches, and more than 50 new references. Now also includes significantly more coverage on aerosols and particle technology, mineral processing, food colloids, smart colloids, surface analysis, preparation methods, and predictive equations.